Please Come! And support our beloved Mabiba Baegne. Mabiba is a Congolese Maestra of dance and drum. She has been on a cancer healing journey since 2013 and has neuropathy in both her hands and feet from the chemo and radiation she has endured. The neuropathy has made it very difficult for Mabiba to teach her craft and to work. Please Come and Support her. 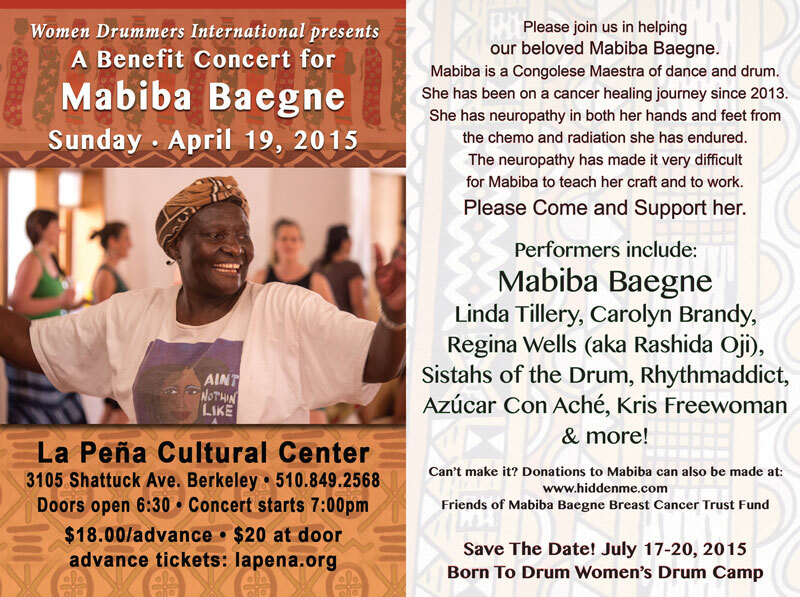 Mabiba Baegne, Linda Tillery, Carolyn Brandy, Regina Wells (aka Rashida Oji), Sistahs of the Drum, RhythmAddicts (featuring Wade Peterson, Ben Isaacs, Gabe Harris and many others) Azucar con Aché, Kris Freewoman and MORE! $20 at door, $18.00 in advance. Please go to www.lapena.org for advanced tickets. Let's have a really GREAT time for Mabiba. Lift her spirits up with LOVE, MUSIC, DANCE, RHYTHM AND FAMILY! Mabiba is an inspiring drummer. In addition to her Congolese dancing, Mabiba has studied West African dunun drumming with master drummer Famoudou Konate in Guinea and she was the first woman to teach this form in the United States. Mabiba is also an acclaimed singer and has toured and recorded with Salif Keita, master drummer Mamady Keita, Samba Ngo and many more. Even if you can’t attend the event, you can always donate to the The Friends of Mabiba Baegne Breast Cancer Trust Fund at: http://www.hiddenme.com/ No amount is too small! This entry was posted in Benefits: Past. Bookmark the permalink.